A dismembered torso sprawls down from the left hand side of the pediment with its right leg caught on the step (Figure 1). Next to it, sporting an insouciant and spritely air, a pair of legs neatly crossed at the knee flaunt a set of elegant cross gaiters. Underneath are other fragments and body parts; the bottom half of a torso without its feet, elegantly clad and protected in decorative armour. In the centre of the image a set of legs with their accompanying feet rest against some rocks. Protecting the knees are the masks of bearded men, as if the head of their owner has somehow been repositioned. Surrounded by other half legs and torsos the image resembles the aftermath of a grisly act of mutilation, the dance macabre of a battlefield. Figure 1. Image from Michel Dandré-Bardon, Costume des anciens peuples, à l’usage des artistes, 1784-6, Vol 2, Plate 11. 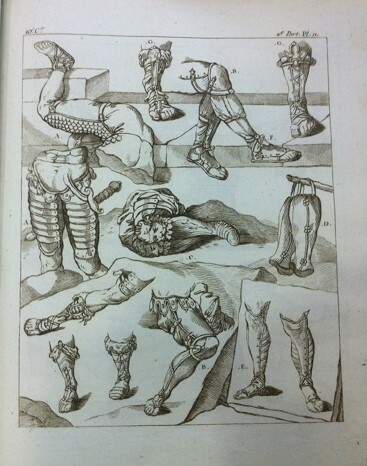 The source of this unsettling image of ornamented body parts is the Sackler Library’s copy of Michel François Dandré-Bardon’s Costume des Anciens Peuples (Figure 2), printed posthumously between 1784-6, and one of a number of costume dictionaries published in late eighteenth and early nineteenth-century France. The Sackler Library’s copy is interesting because even though it was it was printed in memoriam for its author, whose portrait appears in the frontispiece with a short epitaph (Figure 3), it was deliberately produced without the luxurious bindings typical of other costume dictionaries held in the Bodleian Libraries collection in Oxford so that it would remain affordable for artists and the general public. 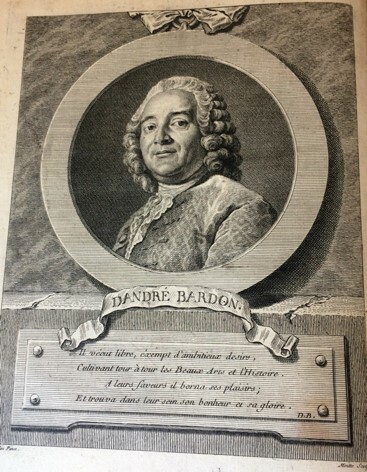 Dandré-Bardon was himself an accomplished history painter and one of the leading figures of the Académie des Beaux-Arts in Paris as well as the founder of the Académie des Beaux-Arts in Marseilles. He was from Aix-en-Provence, and studied painting under the Rococo masters Jean-Baptiste van Loo and Jean Francois de Troy. After winning second prize in the Prix de Rome he went to study in Rome for six years. On his return to France he went back to the Académie as a professor, and by the end of his career headed up history painting at the school. This was significant because history and allegorical painting along with sculpture was the most prestigious sector of artistic production, and the only genre in which works of art could aspire to the beau idéal. Figure 3. Frontispiece, Image of Michel Dandré-Bardon from Costume des anciens peuples, à l’usage des artistes, 1784-6. Figure 4. Image from Michel Dandré-Bardon, Costume des anciens peuples, à l’usage des artistes, 1784-6, Plate 75. In their Dictionnaire des arts de peinture, sculpture et gravure, the art theorists Claude-Henri Watelet and Pierre-Charles Lévesque had engaged with and systemised the structure, styles, purpose and aesthetic effect of ancient costume. 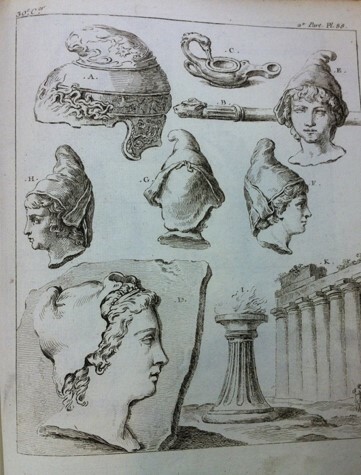 To supplement this theoretical engagement costume dictionaries were produced in Europe, and particularly in France, to illustrate and describe in more practical detail the different items of clothing, varieties of hairstyles, ornaments and accessories that made up the ancient way of life (Figure 4). Particular attention was given to the clothing of the Greeks and Romans, aligning each item of clothing to its historical period, way of life, customs, and habits. Many art critics and theorists believed that the representation of accurate clothing in works of art promoted the status of French art, erasing the shame felt by many for the licentious nature of mid to late-eighteenth century Rococo painting. According to Watelet, as early as the 1760s this desire for a new morality found expression in artistic circles through the inspiration of the leading portraitist of the day, Anton Raphael Mengs, and was signalled in the work of Joseph-Marie Vien and his famous pupil Jacques-Louis David by the adoption of classical dress and subject matter in the genre of history and allegorical painting. Significant attention was paid in the art criticism to the accurate representation of clothing as it became representative of the new morality, and later a growing sense of national pride. An example of the way in which artists such as David used these dictionaries as a resource is illustrated by comparing David’s painting L’Intervention des Sabines with the detailed studies by Dandré-Bardon of Phrygian hats (Figures 5 & 6). Figure 5. Image from Michel Dandré-Bardon, Costume des anciens peuples, à l’usage des artistes, 1784-6, Vol 2, Plate 88. Figure 6. 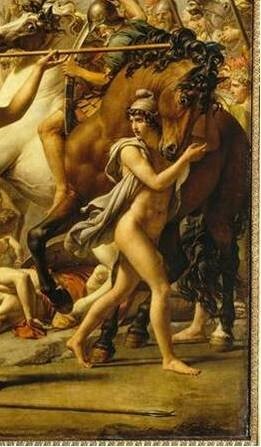 Detail from Jacques-Louis David, L’Intervention des Sabines, 1799, Paris, Musée du Louvre. The style and structure of these dictionaries was varied, and each came with its own particular characteristics and idiosyncrasies. Some of the compendiums were more practical than others in their illustration of antique clothing and household goods. Others used contemporary or ancient art as exemplars. Many of the dictionaries had essays or comments in the text on general philosophical issues surrounding the nature of art, ideal beauty or the status of French painting. 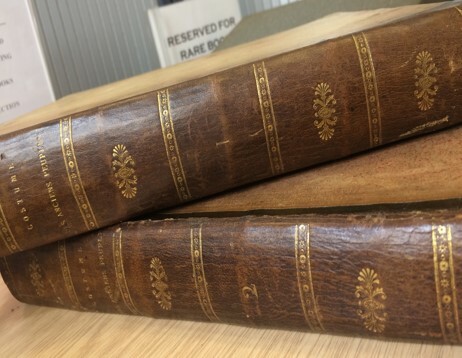 Others, like these volumes by Dandré-Bardon, focused more on an object-based analysis. The resources for these dictionaries were varied. Some authors engaged directly with the work of ancient scholars such as Pliny and Herodotus, and the works of more modern antiquarians such as the Comte de Caylus and Bernard de Montfaucon. Most dictionaries, however, drew much of their inspiration and knowledge from the work of the art historian and archaeologist, Johann Joachim Winckelmann, whose influential L’Histoire de l’art chez les anciens was translated and published five times in France between 1766 and 1802. 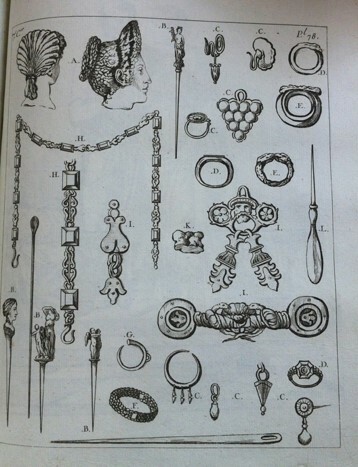 Dandré-Bardon’s analysis and images of ancient costume and accessories was unique amongst the other dictionaries in that he did not cite either Winckelmann or any ancient or modern sources for his compendium, nor did he attribute any broader philosophic or nationalistic purpose for the work. Yet the structure of the two volumes, starting first with the religious, civil and domestic dress of the Greeks and Romans followed by their military costume, and then systematically tracing the clothing and heritage of other ancient peoples such as the Israelites, the Egyptians, Amazonians , Parthians, Scythes, Daces, Sarmatians, Ancient Germans and Persians, strongly echoes the interest expressed in Winckelmann’s Histoire on the clothing of ancient peoples and particularly those of the Greeks and Romans. Instead Dandré-Bardon took his accounts of garment and accessory types directly from the ancient monuments themselves. His starting point of analysis was therefore a description of the individual garments and accessories, followed by an extensive and meticulous interrogation of the context in which they were worn. Figure 7. Image from Michel Dandré-Bardon, Costume des anciens peuples, à l’usage des artistes, 1784-6, Plate 78. Figure 8. Image from Michel Dandré-Bardon, Costume des anciens peuples, à l’usage des artistes, 1784-6, Plate 76. 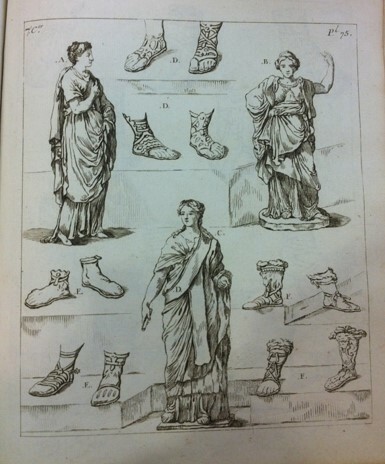 In the text accompanying this image of Greek and Roman sandals (Figure 8), for example, Dandré-Bardon first described how Greeks and Romans ordinarily walked barefoot except when they were travelling, hunting or in battle. 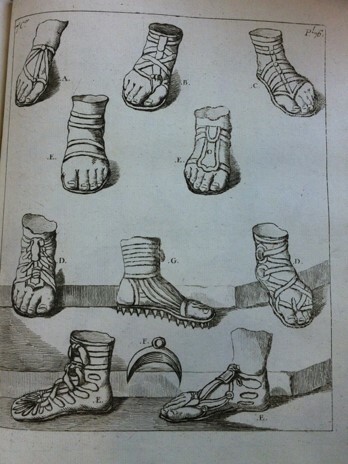 He itemised each of the shoes illustrated A to G, and then described the variety of ways in which they were secured to the foot with either ribbons, bandages or leather straps. He then demonstrated the social significance of different styles and shoes. Patricians and senators, for example, were distinguished with a special gold, silver or ivory lunelle, which replaced the customary loop to secure the straps. He then also described and illustrated how ancients used shoes studded with iron spikes or nail heads to walk on ice or in slippery places. The disquieting image of headless trunks, floating legs and random torsos was therefore part of a broader ethnographic drive to not only chart the details of ancient life and habits, but to provide an important bridge between antiquarian knowledge and artistic practice. It was not sufficient for the artist who used dictionaries such as these to know the correct item of clothing to use in his work of art, he also needed to understand the context of it so that the overall harmony of the painting would not be disturbed, and the knowledgeable art critic and member of the public would be satisfied. These dictionaries, which have been overlooked in recent times, are therefore an essential resource to understanding the significance of clothing in Neoclassical painting. Watelet and Lévesque, Dictionnaire des arts de peinture, sculpture et gravure. 5 vols. (Paris: L.F. Prault), 4.636-637.638. Sackler Library: #A.Ref.1/Wat. Michel Dandré-Bardon and Charles Nicolas Cochin, Costume des anciens peuples, à l’usage des artistes, Nouvelle ed., by M. Cochin. 4 vols. in 2. (Paris Alexandre Jombert jeune, 1784-1786). Sackler Library: #KK:DAN vols. 1-2.